A Knight-errant is not a knight but a knight in waiting, a servant/messenger role in liege to a full knight or Prince. The template of the knight-errant are the heroes of the Round Table of the Arthurian cycle such as Gawain, Lancelot and Percival. The quest par excellance in pursuit of which these knights wander the lands is that of the Holy Grail, such as in Perceval, the Story of the Grail written by Chrétien de Troyes in the 1180s. Although the character is part of the romance genre as it developed during the late 12th century, the term "knight-errant" itself is younger, for the first time recorded (as knygt erraunt) in the 14th-century poem Sir Gawain and the Green Knight. Knight-errantry tales remain popular with courtly audiences throughout the Late Middle Ages. They are written in Middle French, in Middle English and in Middle German. In the 16th century, the genre becomes highly popular in the Iberian Peninsula, Amadis de Gaula was one of the most successful knight-errantry tales of this period. In Don Quixote (1605), Cervantes satirizes the Amadis romances and their popularity. Tales of knight-errantry then fall out of fashion for two centuries, until they re-emerge in the form of the historical novel in Romanticism. A knight-errant typically performed all his deeds in the name of a lady, and invoked her name before performing an exploit. In more sublimated forms of knight-errantry, pure metaphysical idealism rather than romantic inspiration motivated the knight-errant (as in the case of Sir Galahad). Such a knight might well be outside the structure of feudalism, wandering solely to perform noble exploits (and perhaps to find a lord to give his service to), but might also be in service to a king or lord, traveling either in pursuit of a specific duty that his overlord charged him with, or to put down evildoers in general. This quest sends a knight on adventures much like the ones of a knight in search of them, as he happens on the same marvels. In The Faerie Queene, St. George is sent to rescue Una's parents' kingdom from a dragon, and Guyon has no such quest, but both knights encounter perils and adventures. In the romances, his adventures frequently included greater foes than other knights, including giants, enchantresses, or dragons. They may also gain help that is out of ordinary. Sir Ywain assisted a lion against a serpent, and was thereafter accompanied by it, becoming the Knight of the Lion. Other knights-errant have been assisted by wild men of the woods, as in Valentine and Orson, or, like Guillaume de Palerme, by wolves that were, in fact, enchanted princes. 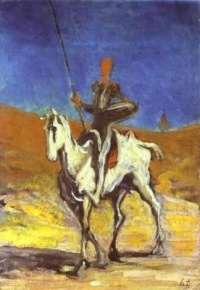 Don Quixote is an early 17th-century parody of the genre, in reaction to the extreme popularity which late medieval romances such as Amadis de Gaula came to enjoy in the Iberian Peninsula in the 16th century. A depiction of knight-errantry in the modern historical novel is found e.g. in Sir Nigel by Arthur Conan Doyle (1906). The knight-errant stock character became the trope of the "knight in shining armour" in depiction of the Middle Ages in popular culture, and the term came to be used also outside of medieval drama, as in e.g. The Dark Knight as a title of Batman. The Russian bylina feature bogatyrs, knights-errant who served as protectors of their homeland, and occasionally as adventurers. Some of them are presumed to be historical figures, while others are fictional and possibly descend from Slavic mythology. Most tales about bogatyrs revolve around the court of Vladimir I of Kiev. Three popular Russian knights—Ilya Muromets, Dobrynya Nikitich and Alyosha Popovich (famously painted by Victor Vasnetsov)—are said to have served him. Youxia, Chinese knights-errant, traveled solo protecting common folk from oppressive regimes. Unlike their European counterpart, they did not come from any particular social caste and were anything from soldiers to poets. There is even a popular literary tradition that arose during the Tang Dynasty which centered on Negrito-slaves who used supernatural physical abilities to save kidnapped damsels in distress and to swim to the bottom of raging rivers to retrieve treasures for their Feudal Lords (see Kunlun Nu). A youxia who excels or is renown for martial prowess or skills is usually called wuxia. In Japan the expression Musha shugyō described a Samurai who wanted to test his abilities in real life conditions would travel the land and engage in duels along the way. From Middle English knight, kniht, from Old English cniht, cneht, cneoht ‎(“boy, youth, servant, attendant, retainer, disciple, warrior, boyhood, junior member of a guild”), from Proto-Germanic *knehtaz (compare Dutch knecht ‎(“attendant, servant”), German Knecht ‎(“lad, slave”)), originally ‘billet (wood), block of wood’ (compare Dutch laarzeknecht ‎(“boot-jack”), dialectal German Knüchtel ‎(“bat, club”)), from Proto-Indo-European *gnegʰ-, from *gen- ‘to ball up, pinch, compress’. Unless indicated otherwise, the text in this article is either based on Wikipedia article "Knight-errant" or another language Wikipedia page thereof used under the terms of the GNU Free Documentation License; or on original research by Jahsonic and friends. See Art and Popular Culture's copyright notice. This page was last modified 12:06, 30 September 2015.